On Aug. 24, DBO Commissioner Jan Lynn Owen hosted an industry roundtable with the Governor’s Office of Emergency Services (Cal OES) director Mark Ghilarducci and Insurance Commissioner Dave Jones to explore potential solutions and stopgaps to problems facing survivors of the recent catastrophic wildfires. As a result of that meeting, the DBO announced a partnership between state-chartered Poppy Bank of Santa Rosa and Northern California Financial Development Corporation (Nor-Cal FDC) to extend a $450,000 line of credit to Chiaramonte Construction and Plumbing Inc. (Chiaramonte) to help rebuild 250 homes in an area of Sonoma County that burned in the 2017 wildfires. Nor-Cal FDC provided an 80 percent guarantee to the line of credit Poppy Bank provided Chiaramonte. Nor-Cal FDC is a public benefit corporation chartered and regulated by the Governor’s Office of Business and Economic Development. Under the State Loan Guarantee Program, Nor-Cal FDC provides guarantees for loans, and specializes in helping small businesses that do not meet traditional lending guidelines. 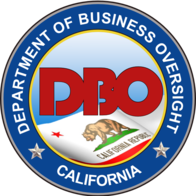 The DBO also asks our licensees – banks, credit unions, mortgage lenders and others – to continue to provide as much discretion and latitude as possible to help fire victims recover and rebuild. The DBO enforces the Corporate Securities Law of 1968 and its implementing regulations. The DBO’s Broker Dealer and Investment Adviser (BDIA) Division oversees the investment advisory program which consists of a registration and examination component. Both components are critical to the integrity of the investment advisory industry and the protection of investors. Starting in October, the DBO will launch an annual online Investment Adviser examination for certain registered Investment Advisers. The mandatory examination consists of an online questionnaire that California-registered investment advisers are required to complete and submit to the BDIA. Although the Division has the authority to conduct on-site examinations of investment advisers with or without notice, the Division has determined that, in certain cases, an online examination will be conducted. California-registered investment adviser firms that have a principal place of business in another state are required to complete the online examination. Starting in October, the Division will send examination questionnaires to firm’s designated email addresses. Designated email addresses must be dedicated to DBO communications and monitored by a firm’s executive staff to ensure prompt attention to communications from the DBO. Firms must complete and submit the online examinations to the DBO. After reviewing examination responses, the DBO may have additional questions or requests for information, or may determine that an on-site examination is warranted. For questions or inquiries, please contact the BDIA at IAAEQ@dbo.ca.gov. Credit unions with fiscal years that ended on June 30, are required to file their annual audit report with the DBO by Oct. 31, 2018. Please ensure all financial statements and management letters required by FC 14252 and CCR 30.1000 are included, as well as reports of confirmation of member accounts where required by CCR 30.302(b). Reports should be submitted to cuannual.auditreports@dbo.ca.gov. If a credit union fails to submit this required report on time, the DBO has the authority under FC 14256(b) and FC 329 to impose fines for each day late. Questions about the audit report may be addressed to the DBO credit union portfolio manager for your region. The DBO website identifies the DBO contact for each credit union. Applications for a Property Assessed Clean Energy (PACE) Program Administrator license are now available through the Nationwide Multistate Licensing System and Registry (NMLS) website. PACE Program Administrators must be licensed by the DBO by Jan. 1, 2019 to do business in California. The NMLS Getting Started page provides instructions on submitting an application. For NMLS-related questions, call (855) 665-7123. The DBO’s website provides additional information about DBO’s PACE program and regulations process. The Conference of State Bank Supervisors (CSBS) on Aug. 8 announced that all states and U.S. territories will now use a single, common examination to assess mortgage loan originators (MLOs), streamlining the licensing process for MLOs and supervision of the mortgage industry. The Uniform State Test is one of several initiatives, collectively known as Vision 2020, that state regulators have devised to improve the state licensing process for all nonbank financial services. Previously, a mortgage license candidate would need to take multiple tests – a national exam an exam for each state license. A license applicant who passes the national test will not need to take any additional state tests to hold a license within any state or U.S. territory. The State Controller’s Property Tax Postponement (PTP) Program allows senior, blind or disabled homeowners to defer current-year property taxes on their principal residence. To qualify, homeowners must meet certain criteria including having at least 40 percent equity in their home and an annual household income of $35,500 or less. Applications are available online and may be filed with the State Controller’s Office beginning Oct. 1. For additional information, contact Karen Garcia at (916) 445-5469 or KMGarcia@sco.ca.gov. The Office of the Comptroller of the Currency (OCC) on Aug. 28 released an Advanced Notice of Proposed Rulemaking (ANPR) seeking comment on the best ways to modernize the regulatory framework of the Community Reinvestment Act (CRA). The CRA was enacted in 1977 to encourage insured depository institutions to help meet the credit needs of their communities, including low- and moderate-income neighborhoods, consistent with the safe and sound operation of such banks. Through this ANPR, the OCC seeks stakeholder comment on ways to modernize the regulations that implement the CRA, to better achieve the statute’s original purpose, increase lending and investment where it is needed most, and reduce the burden associated with reporting and assessing CRA performance. The OCC submitted the ANPR for publication in the Federal Register, with a 75-day comment period from the date of publication. The complete bulletin is available at the OCC website. Next Wave Premium Finance, Inc.
Eric Magee and Chad Bitterlich, to acquire control of Western Pacific Finance, Inc.
BDC Payments Holdings, Inc., to acquire control of Bill.com, Inc.
PayPal, Inc. to acquire control of HSI USA, Inc. The September 2018 Monthly Bulletin covers the month ended August 31, 2018. It is issued pursuant to Financial Code section 376.
Credit union annual audit reports are due in this office on or before October 13, not October 31 as reported in the September 2018 issue of the Monthly Bulletin. Please note the corrected notice below. Credit unions with fiscal years that ended on June 30, are required to file their annual audit report with the DBO by Oct. 13, 2018. Please ensure all financial statements and management letters required by FC 14252 and are included, as well as reports of confirmation of member accounts where required by .